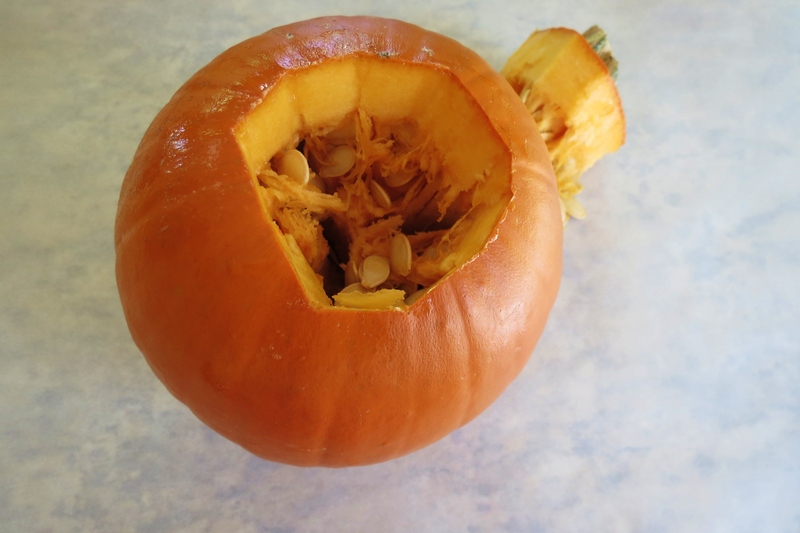 I thought today I would show you how you can make your own pumpkin puree just like you would get in a can, plus how to roast the perfect pumpkin seeds. I figured with pumpkin season pretty much here, this would be the perfect time to get your pumpkin on!! First thing I did was buy a Sugar Pumpkin from Trader Joe’s! 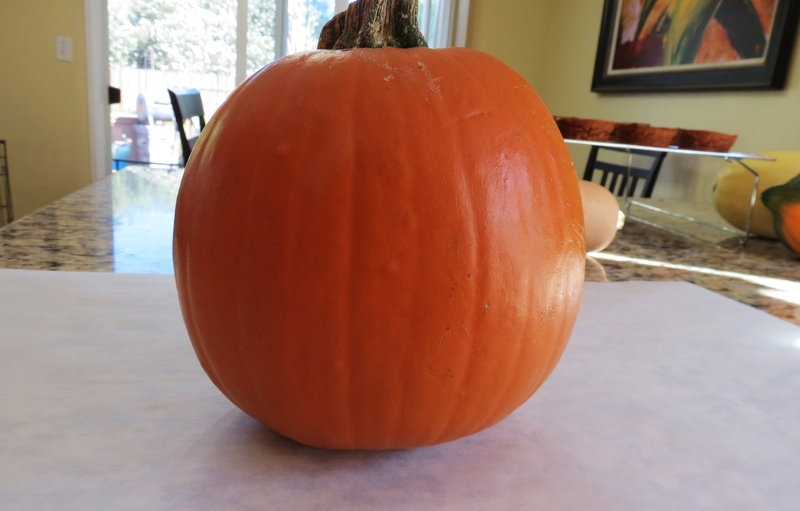 Then preheat the oven to 400 degrees F.
Cut out the top of the pumpkin like I were going to carve it. 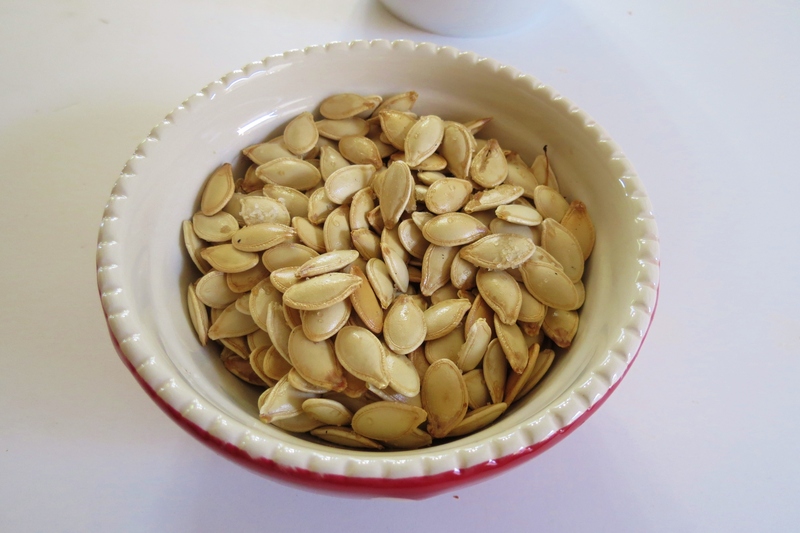 With a spoon, scrape the seeds out and set them a side. You don’t want to waste them, so lets roast them next! This is where you decide what your going to use the pumpkin for. 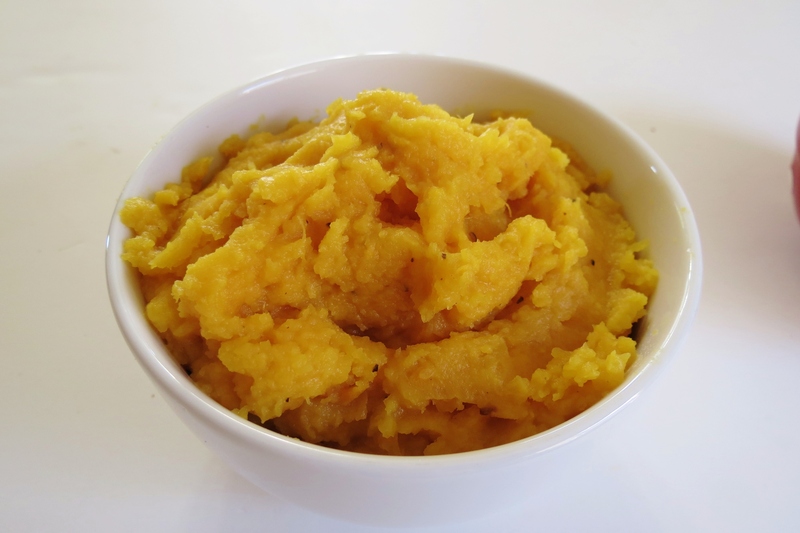 Do you want a simple puree unsweetened natural, perfect for baking? 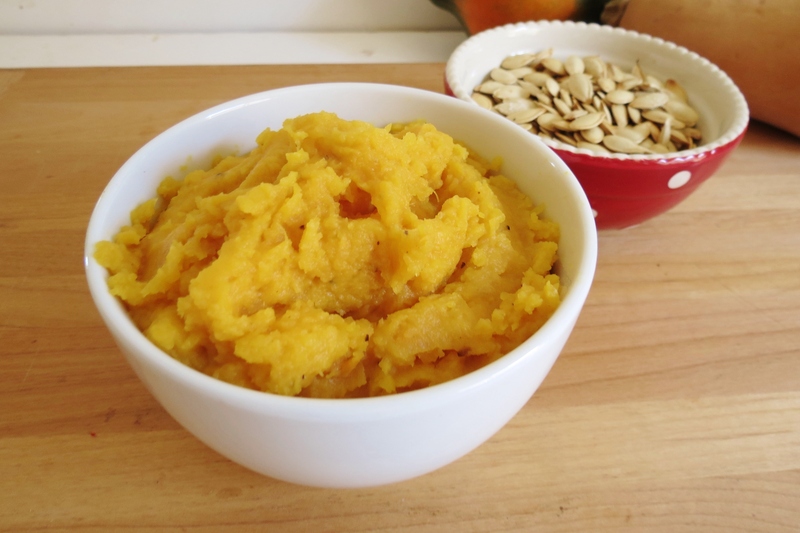 Or do you want a savory pumpkin puree which is perfect for soups and meals? For me I went with savory because I have plans for this pumpkin. 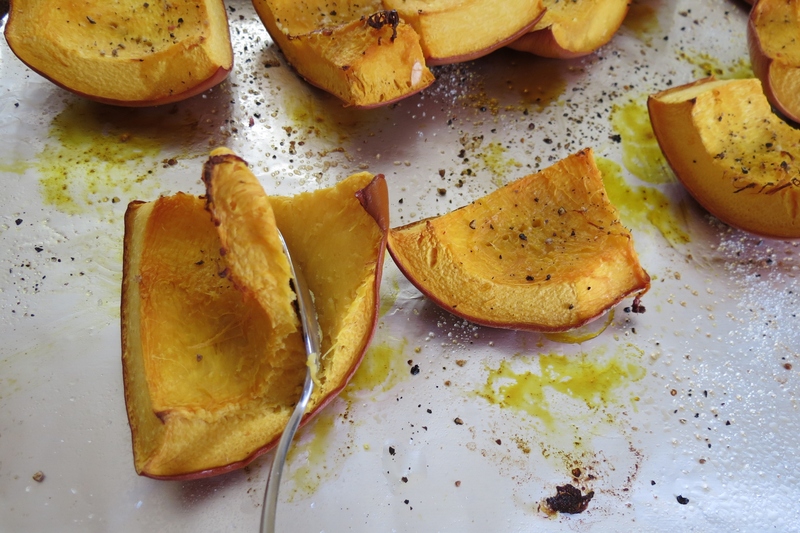 For savory I drizzled the pumpkin with olive oil and sprinkled with salt and pepper. If you want it plan, just leave it as is! Bake in a 400 degree for 30 – 40 minutes, until fork tender. You don’t want it mushy! Then peel away the skin on the pumpkin. 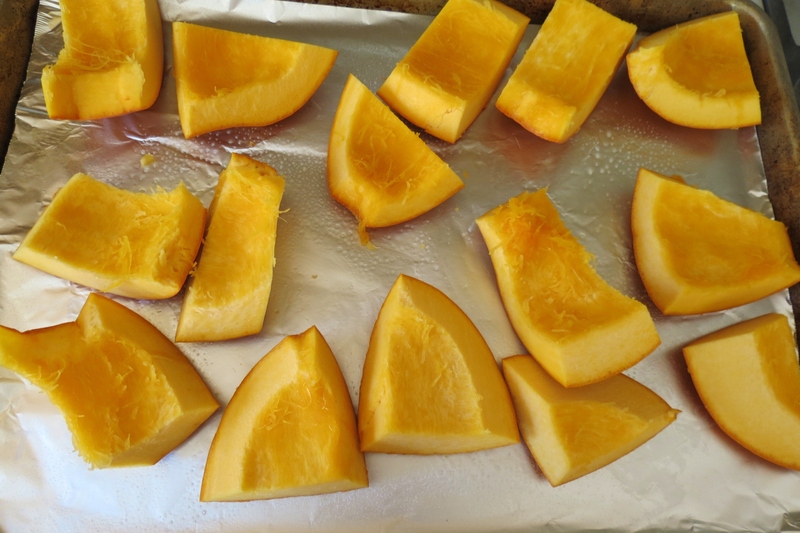 You could also cut the pumpkin into chunks, for adding to a dish or having it by it’s self as a side. Kind of like what you would use butternut squash for. If you choose to puree the pumpkin, add all pieces to a food processor and processes until creamy. If the pumpkin seems too thick, add water. I added 3 tablespoons of water to mine. Just add it one tablespoon at a time until it is the consistency you like. Now you have pumpkin puree!! 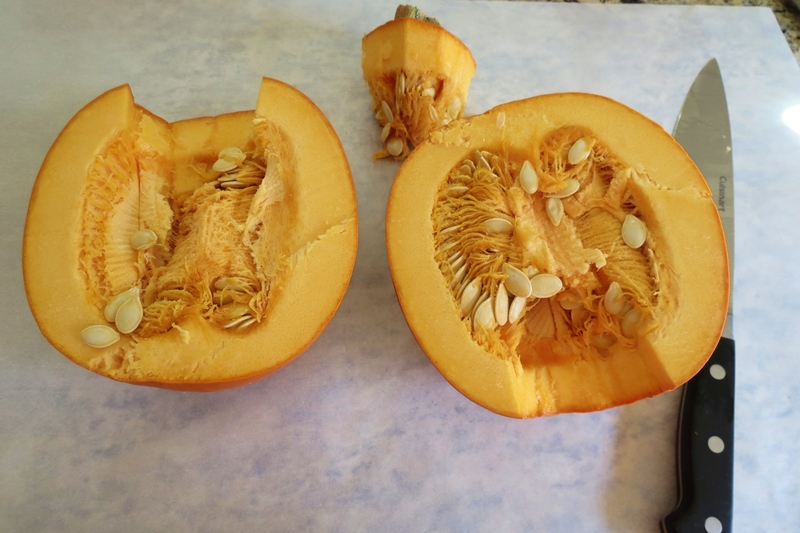 Cut the top off of the pumpkin, then cut in half. 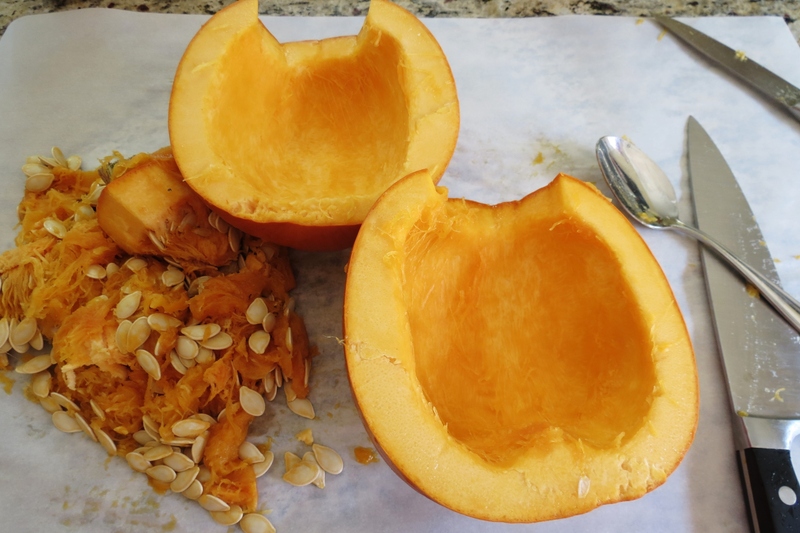 Take all of the seeds and pulp out of the pumpkin. Use for a later use. Place the pumpkin on a baking sheet either side up or down. Bake in the oven for 30 - 40 minutes until fork tender. Once pumpkin is cool enough to handle, scrap the pumpkin out of the skin. 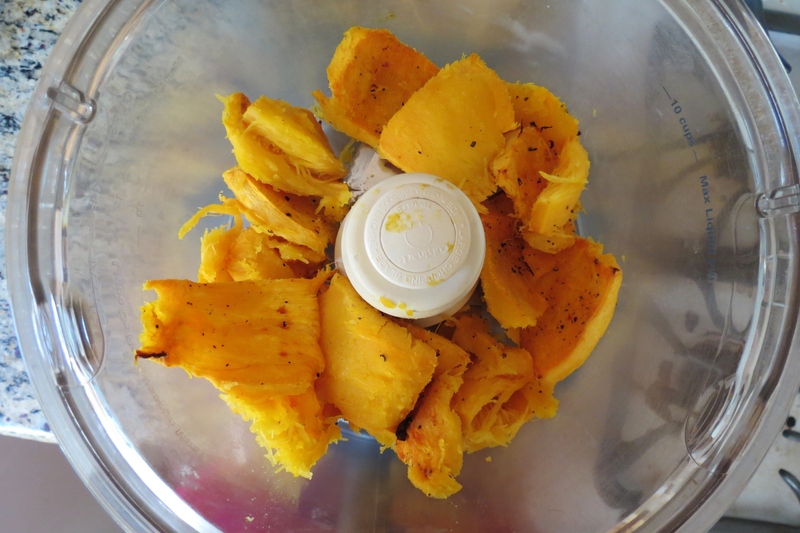 Place pumpkin in a food processor and blend until smooth. Add water 1 tablespoon at a time to get the consistency you like. Store pumpkin in an air tight container and place in the refrigerator or you can add the puree to a Ziplock Freezer Safe Bag and freeze until ready to use. 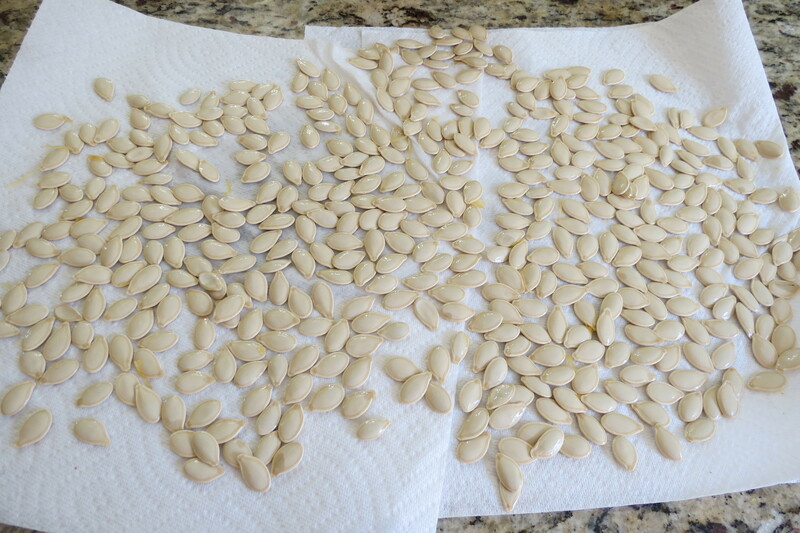 Time to make pumpkin seeds! This is really easy as long as you don’t mind touching pumpkin guts!! 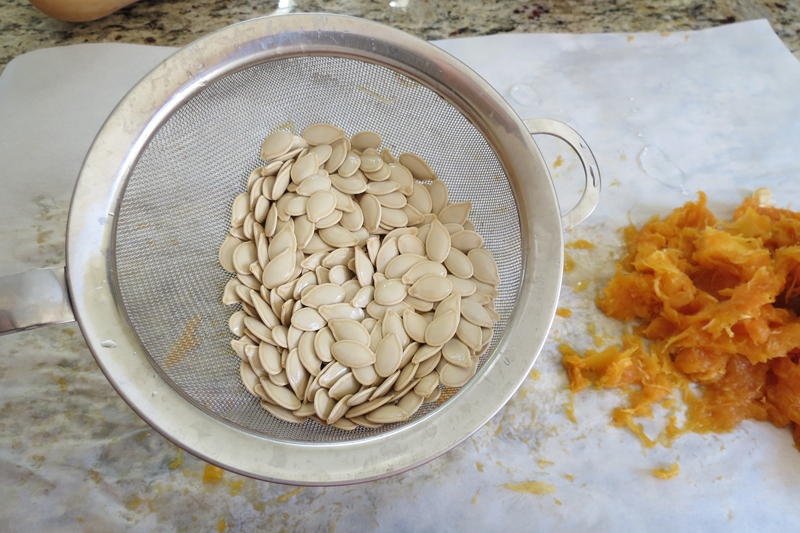 First thing you do is clean the pulp off the seeds and place in a strainer; run under water to get the remaining pulp off the seeds. Then place the seeds on a paper towel to dry, about 30 minutes or so, if your in a rush, just dab the seeds with a paper towel, but be warned they stick to the paper towel. Place the seeds on a baking sheet lined with parchment paper and lightly spray the seeds with cooking spray and sprinkle with salt. 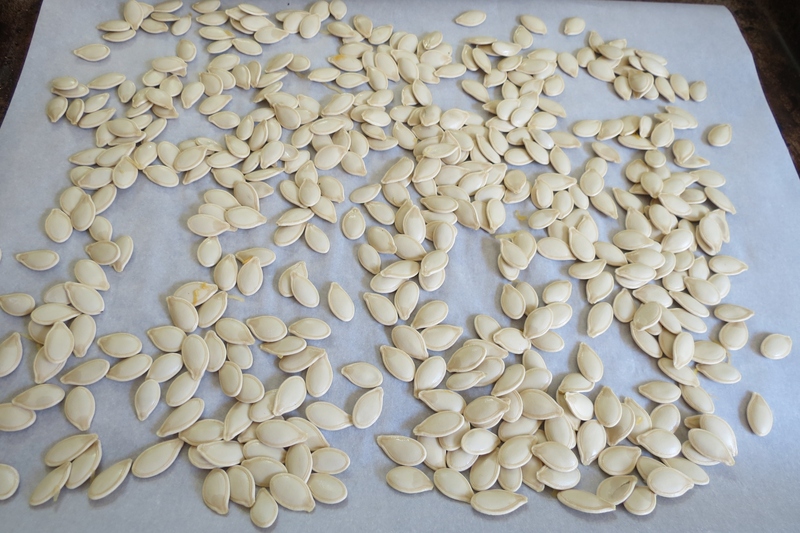 Turn your broiler to the low setting and roast the pumpkin seeds for about 8 – 10 minutes or until lightly golden and crispy. 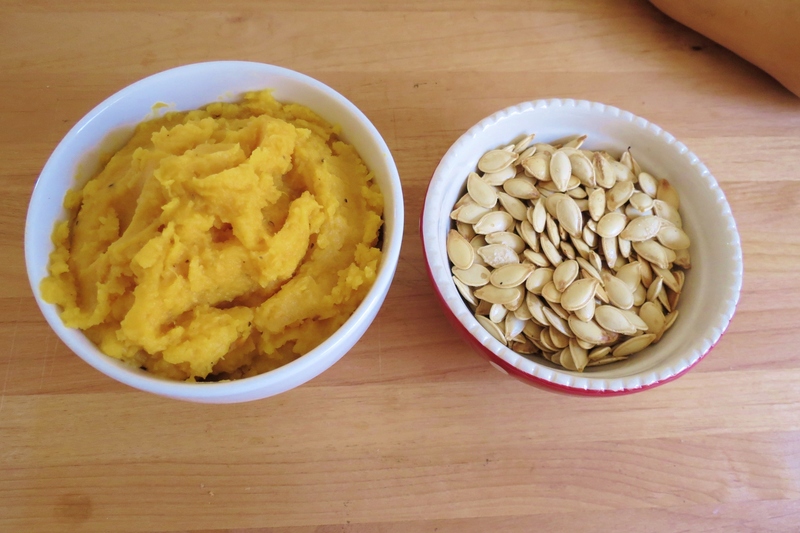 Sorry I didn’t post a recipe today, but making your own pumpkin puree means you can make lots of recipes. Stay tuned tomorrow for a faboulus recipe that I am excited to share with you!! I totally agree with you. I never use canned pumpkin puree because it is just so easy to make your own and it adds so much more flavor! I agree definitely more flavor!! Plus i liked making it. It smells so good roasting in the oven!! What an awesome tutorial! I’ve used the last of my pumpkin from the freezer and will be making more soon. 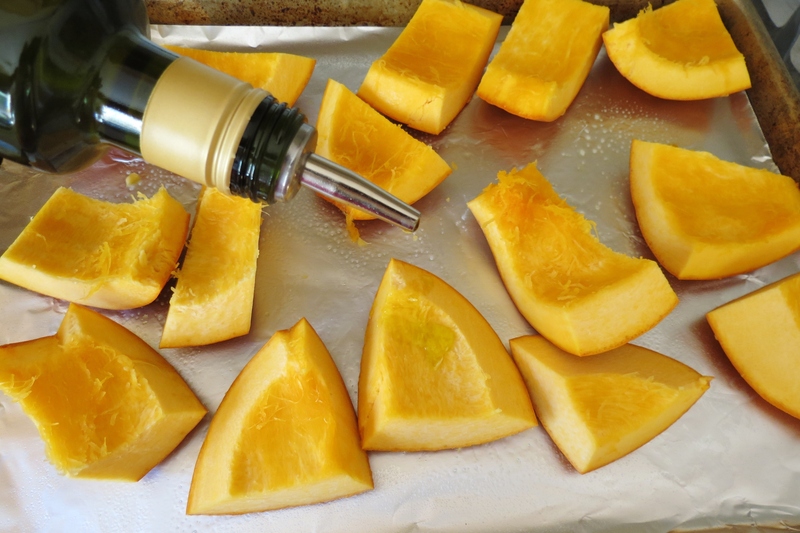 Such a great idea to DIY….especially when pumpkin gets tough to find on the store shelves! Ahhh, Thank you!! It’s weird how it’s hard to find pumpkin, but I don’t mind making it, so easy!!! Mine doesn’t have pumpkin yet either! The lady at TJ’s said this holiday season there getting a lot of new and wonderful items. But she couldn’t tell me what! I can’t wait!! This post makes me so happy because it reminds me that fall is here! 🙂 yay! Your puree looks great!! Thanks Kristi! I’m a summer person, but I am looking so forward to Fall myself! I can’t wait to head up to Apple Hill which is near Placerville. You can pick pumpkins, apples, get lots of yummy food and it’s a beautiful ride through the hills. You and your Husband should go there for a day. You will love it!! I have a question that might be kinda a dumb question. My kids never did carve their pumpkins for halloween and I don’t want them to just rot. Can I use one of those pumpkins to make this puree or is there a certain pumpkin that should be used? Honestly, I have no idea, but I don’t see why not. I googled it and a lot of sites said you can, you just may need to add more sugar to your recipe. I say go for it and try it out. Pumpkins are edible, they just may taste a pinch different, but I’m betting adding some sugar and pumpkin spice and you’ll probably be good. Let me know how it goes, I’m curious to how it turns out. I am so glad it turned out! What a great way to use a traditional pumpkin! If I run across any pumpkins, I’m going to try it!!! Thanks for stopping back and letting me know! !